Anti-Wrinkle. Eye Brightener. Dry, Sensitive Skin. Illuminate the eyes and rejuvenate the skin with this moisturizer. Dry, sensitive skin. Fades away fine line and reduces wrinkles around eyes. Prevents premature aging and fights free radicals. Nourishes and infuse moisture. Revitalizes, improves tonus and smoothes while showing bright eyes and ageless skin. 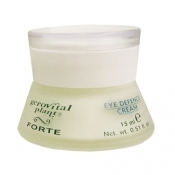 Every day, morning and evening, after cleansing and toning, massage gently the cream around eyes. Gerovital Plant - Eye Gentle Cleansing Lotion. Elastin and Sepilift vanish away the fine lines and decrease wrinkles. Vitamins A and E block free radicals damages. Squalene, Cocoa Butter and Marigold Oil regenerate and hydrate.